Great idea for potato skins. And the recipe looks easy enough. Thank you for posting. These sound and look amazing, definitely a recipe that I will be trying out! Thanks for sharing it! This dish is so easy to make and a nice side dish to make this Fall with my meat dishes. My family would love these Twice Baked Potatoes! 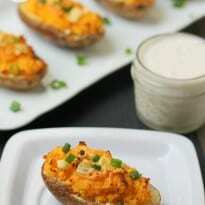 I love twice baked potatoes, you can add anything you want to make them your favourite, my favourite is onion, bacon,and cheese!! Well I know what I’m making next Packers game. Oh my right up my alley, look so good, we tried your recipe for Creamy chicken and rice last night, it was delicious!! Thank you for posting these delicious recipe’s! These look so yummy and with potatoes so economical in the fall – how can I resist but to make these?!?! Mmmmm! oohhh..these look too good to make..I would eat too many! Twice baked potatoes are a lot of work but they’re so good, they’re worth it. These look delicious! Yum! I like buffalo sauce, I can’t wait to give this a try. Thank you for sharing this recipe. Thankfully, I have not had any potato recipe fails. Oh yum – these look great! I love spicy and these would be a perfect for game day. Recipe fails? Yes, too numerous to mention! Lol, but I keep trying! 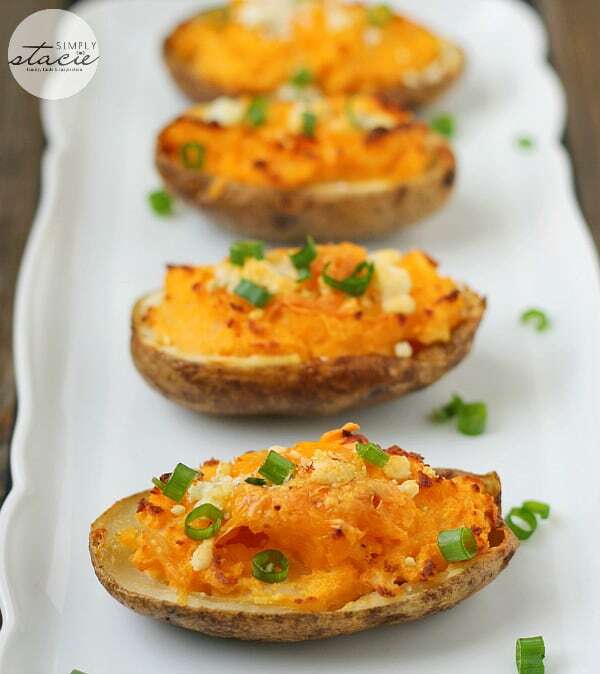 I’ve got to make these potatoes, though, I love twice baked potatoes and I love Buffalo sauce! Mmmmmm! What’s not to like! This was so simple and delicious!! My favourite things potatoes n cheese!! These look/sound so good. I love buffalo so this is definitely appealing! I can’t wait to give it a try! definitely going to save this recipe! these look delicious!! thanks for sharing! Look and sound good. I like twice baked potatoes and buffalo wings so putting them together sounds great. Love all the cheese, too. Tasty! I wish I had these fro breakfast lol! 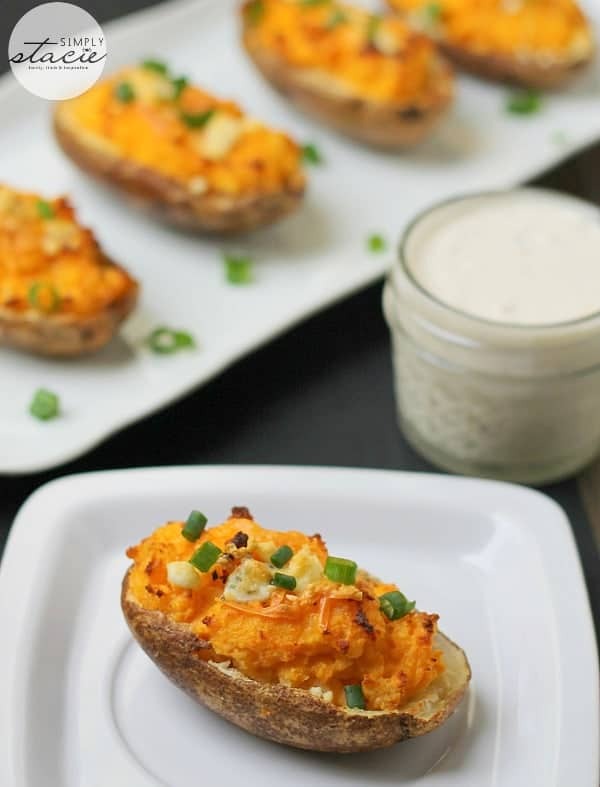 Love twice-baked, and the Buffalo Sauce is a great idea to kick them up a bit! I’ll have to try this one (I pinned it for later reference). Looks like a simple enough recipe that gives a familiar favorite a new twist. Thanks for sharing! These look amazing. I am such a potato lover – baked, fried, hash – so this is totally my kind of meal! 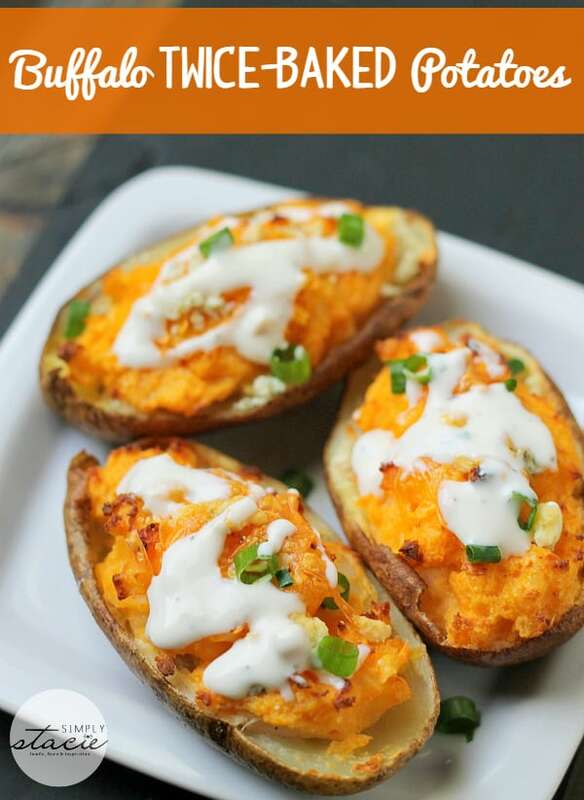 OMG these look so yummy I will def be making some of these, I love a twice baked potato! Love baked potatoes but always stumped with being more creative with my recipes, thanks! nice recipe, they look cheezy n awesome. It has been a while since I have worked with potatos like this. I used to get creative but have been doing other things I guess. I love the sound of this. Thanks for the great idea!!! This is such a great appetizer idea. I can’t wait to try it! Love buffalo wings, definitely trying this mouthwatering recipe! I hear ya! I like twice baked potatoes but not putting them together. It’s a lot of tedious work. When I do make them (hardly ever), I like to make huge amounts at one time and freeze them so I don’t have to go through the trouble too often. Haha! My son likes buffalo wings but is not big on potatoes. I wonder if this recipe could convince him that potatoes (which I love) aren’t as evil as he thinks they are? These would be great snacks for a sports evening! Hi there! Just letting you know that your recipe was chosen as the feature today for What’s Cooking Wednesday! I am a huge fan of twice baked potatoes! Hope you come link up again! These would be great for a Sunday dinner. My husband would love these. One of my favorite side dishes to serve my family are baked potatoes. I love this recipe and plan to make it this week as I seem to have all the ingredients in my pantry. Thank you very much. I just pinned this recipe. I can’t wait to try this. They look delicious and our family loves potatoes.